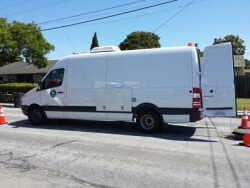 Oro Loma’s Sprinter CCTV van’s longer, taller and thinner design provides more room for passing traffic when set up in the street, more room for equipment, and an ergonomically sound work space. The newly designed operator station is equipped for two workers rather than one, and has three monitors for viewing the live feed, CCTV software and mapping systems. 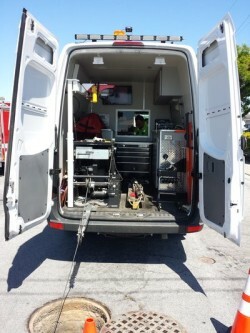 This work station allows for better hands-on operator training. 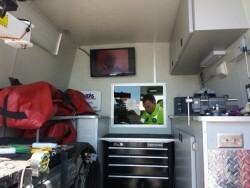 The back-up monitor screen mounted on the dash is also connected to the live feed, providing the supervisor or construction inspectors an additional location from which to watch the live inspection without standing in traffic. The rear workstation is also equipped with a live feed monitor, so the operators can see what’s going on when they are out of the operator station. 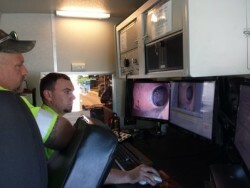 This station is where the CCTV camera is maintained and adjusted for the variety of pipe sizes being inspected. The rear workstation is tall enough to accommodate the tallest of workers, is equipped with a full work bench and tool box, has a built-in water tank for cleaning the camera, a mini-crane for lowering the heavier tractor into the pipe, and a winch holding 1,500 feet of cable when full.